1. Black-ink Bookmarks (pictured) can be obtained only by coming to one of my in-person events. My debut event for these bookmarks will be the UCF Book Festival in April. After which, watch my schedule or contact me to plan your own event. I love doing book signings, classroom visits, book club discussions...you name it :). 2. Red-ink Bookmarks can only be won, like through my weekly One Sentence Challenge or through giveaways (Bloggers, feel free to email me if you'd like some of these LE bookmarks for your site). 3. 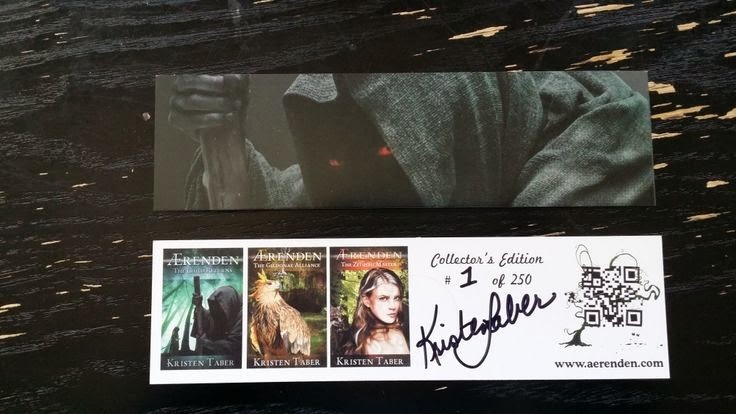 Blue-ink Bookmarks are for promos, so if you'd like to become an Ærenden advocate by handing out these special bookmarks to family, friends, your book club, school or at other events, or heck, you own a bookstore and just want a stack for your counter.... email me! 4. Green-ink Bookmarks...well, let's just say I've reserved my favorite color for random and special moments. I may give one out to someone who's done something super nice. I may leave a stack of them behind on the Metro or put a few in a random book somewhere. You never know when these will show up, so just pay attention. Each batch will be limited to no more than 250. When they're gone, then that's The End :). What's amazing about this is some day they'll be worth....probably nothing, since I'm just a small Indie Author. But the point is to have fun with them! So who wants one? The first and tenth comments on this blog post will get a green-ink bookmark for their collection :D.